The day of the week you choose to make your standard publishing day for blog posts, as well as the day you send email newsletters generally isn’t super critical. It often depends on other factors like if you have ohhwr emails sending on certain days. We default to Mondays since this allows the full week for the post to be opened, shared, etc. But if you’d prefer to have us publish on Tuesdays, Wednesdays, or Thursdays, that’s not a problem! Fridays and weekends aren’t ideal, since people are more likely to tune out and not open emails these days. We will avoid publishing on holidays like Christmas and New Years. US morning hours are best so that you can catch most of your US and European audience before they’re sleeping. We schedule social media posts throughout the week so that these can be seen on a variety of days. So, you’ve heard us mention these “email newsletters” a few different times, and they sound great. But, what on earth are they? Here’s what you need to know about these broadcasts. What exactly are email newsletters? For each blog post we create for you, we’ll also draft a corresponding email newsletter to drive your email subscribers to view your new post. These newsletters are sent out on the publish day of your post, approximately an hour after the post publishes. Who do you send email newsletters to? In the “Getting Started” form you filled out following your kickoff call, you indicated what email list you’d like these weekly newsletters distributed to. We’ll send these weekly or bi-weekly broadcasts to that list as instructed, unless you tell us otherwise. We recommend sending your email newsletters to anyone who has opted-in to receive content from you. We can help you configure your email tool (we recommend Drip) to tag and classify subscribers who should receive your newsletters. What if I want my newsletters to be more branded? This is a question we get about our email newsletters pretty frequently. The newsletters we create for your blog posts are mainly text-based. But, for good reason. We don’t recommend a heavily designed and branded email, as we’ve found that a plain text email is more personable, making it that much more likely to get opened and read. We will sign off your emails with “YOUR NAME and the team at YOUR COMPANY NAME”. However, if you have a simple template created that includes your preferred signature, we can utilize that pre-set template when creating your newsletter. Just let us know! Are email newsletters different from an email course? Great question! Yes, if you signed up to have us create your email course, these weekly newsletters are a totally separate initiative. While email newsletters are sent out regularly to promote specific blog posts, your email course is a standalone email series (consisting of seven total emails) that people can sign up for on your website. In order for us to schedule and publish blog content for you, you’ll need to provide us with access to your WordPress account—which you take care of when filling out our “Getting Started” form after your kickoff call. Making us an administrator gives us the ability to not only create blog posts, but also install and update plugins. If you want to be hands-off with the process, we recommend you give us administrator access. This means we can install the plugins we’ll need, without requiring anything from you. If you prefer, you can give us temporary administrator access to your WordPress account to have us install those plugins, and then move us to “Author” access once that’s complete. This allows us to publish posts for you, without the ability to install any plugins. This means you’ll need to take care of installing the plugins yourself. This is definitely doable, but makes for more work on your end. So, again, we recommend giving us administrator access—even if it’s just temporary. Before we begin drafting an articles for your blog, you’ll receive a document from us. This document details your target customer, the first batch of blog post titles we plan to publish, and the general themes and categories we plan to cover on your blog. As you might expect, these categories will group similar posts together, and will eventually become large resource collections on their own. How many categories should you have on your blog? One question we get pretty frequently is about how many categories is too many. In our document, we’ll share anywhere between 4-7 categories of topics we want to cover. If you have categories of your own that you want to keep (such as product announcements and company news), these can start to add up. There’s no hard and fast rule about how many blog categories you should have. The important part is to ensure that each category brings something different to the table for your target audience. It’s possible that some or many of your existing categories can be combined with ours to avoid any overlap. If you have questions or would like further direction with your existing categories to identify any overlap or redundancy, feel free to let us know! Guest posting on other industry-relevant blogs and websites can be a great way to expand your reach and establish even more credibility. If you’d like to work with Audience Ops to create guest posts for sites other than your own blog, here’s what you need to know. Will you write guest posts for me? Any relevant information you’ve been given about topics, focus, etc. Will you outreach to other blogs and websites for me? This is a piece of the process we don’t handle. You’ll need to take care of getting connected with any sites you’d like to publish a guest post on. But, if and when you do secure your own guest posting opportunities, we can move forward with authoring the posts for you. What’s the cost for guest post articles? If you’re interested in guest post articles, let us know and we’ll follow up individually to talk over pricing. Although Infusionsoft is not our recommended email marketing platform ( Drip is the tool we highly recommend if you’re starting up with email marketing or thinking about moving to a new one), if you’re already using Infusionsoft, then here’s some info about how Audience Ops can “plug in” into your workflow. We don’t recommend Infusionsoft for a few reasons. Primarily, we think it is over-complicated and too confusing to use. In fact, it often requires hiring a 3rd party consultant just to help you operate your Infusionsoft! Not to mention, Infusionsoft itself is quite expensive compared to other tools on the market today—and frankly, it’s not necessarily better than lower-priced alternatives. Alternatives like Drip offer a similar set of “email automation” features, with a far simpler interface. It’s also easier to integrate in your website. That said, we know that Infusionsoft users have already paid a substantial setup fee to use that platform, and oftentimes are entrenched in their system with no plans to move. So if you find yourself in this boat, then we’re still happy to work together! Since every Infusionsoft account is a little different, each with it’s own intricate system of automations, workflows, and lists, and integrations, we (Audience Ops) will need a little guidance from you in regards to where we should input the content we produce for you. Typically, Infusionsoft users are fairly familiar with the system and can point us in the right direction. But if you need help with operating or setting up your Infusionsoft account, then it might make sense to work with a dedicated Infusionsoft consultant—and put that person in contact with us. The company we highly recommend for this System.ly. They can help you (and us) organize your subscriber funnels, campaigns, tagging strategy, and broadcast emails. (If you opted for our Email Course package) We will write a 7-part educational email sequence to serve as your primary “lead magnet”. Point us to a “Campaign” that is configured to send to people who subscribe to your course from your website. This campaign’s content can be blank. We’ll fill it in with our 7-email sequence. You/your team can then “launch” this course to your subscribers and/or integrate your website signup forms to subscribe visitors to it. In addition to your automated email course, we’ll also send weekly (or bi-weekly) “live” email newsletters to promote your latest article that we’ve published on your blog. Provide us with a simple set of guidelines as to who we should define as your recipients (or “contacts” who should receive your weekly newsletter. The more detail you can provide, the better. Specific tips as to the specific settings you want us to define in your weekly broadcast newsletters will be helpful. Alternatively, you may choose to manage the sending your email blasts yourself. In this case, we will provide you with the finished text for each weekly newsletter, which you or your team can then input and schedule to send in Infusionsoft. If you’re using Mailchimp, then we can set up our recommended automation workflows for you, and help you set up your new or existing Mailchimp account. If you’re using a tool other than Mailchimp, then you can implement similar automations, if possible. We’ll group all subscribers who should be receiving your newsletter with the tag, “Newsletter”. When we set up and schedule your weekly broadcast newsletter, we’ll set up the recipients to be all subscribers who are in the group “Newsletter”. If we created an email course for you, we will set it up so that anyone who subscribes to this course will be entered in the Group “[Course] Name of Course”. We will also set up an automation to temporarily remove the “Newsletter” grouping while a person is actively going through your email course. This ensures they won’t be overwhelmed with too many emails during the week they are going through your course. Once they complete your email course sequence, the “Newsletter” group will be re-applied and they’ll receive your weekly email newsletters going forward. Whenever someone opts-in for a Content Upgrade on your blog, our WordPress plugin will automatically send that subscriber’s info (name & email) into your Mailchimp account. We’ll automatically group those people with “Content Upgrade” making it easy to filter by people who’ve opted for a Content Upgrade. We’ll also set up an automated, conditional*, email that is sent to someone approximately 1 week after receiving a Content Upgrade. This email will “pitch” your email course and allow them to subscribe to it by clicking a link in that email. *This email will only be sent if the person has not yet gone through your course. All clients of Audience Ops will receive free licenses for these plugins, and we will install, configure, and use them to deliver our service. We use the Content Upgrades plugin to create unique email opt-in call-to-actions embedded in your posts. For more information about how we use Content Upgrades, click here. If we’re creating a lead magnet for you, such as an email course or eBook, then as part of this project, we can create a landing page to be used to promote it. We use the Landing Pages plugin to create an optimized Landing Page used to promote your email course lead magnet. This is useful if you’re driving targeted traffic to your course, perhaps from PPC campaigns, Retargeting campaigns, guest article links, or other incoming traffic sources. We use this popular plugin, which enables us to embed a “Click to Tweet” quote, allowing your readers to easily Tweet a compelling quote from your blog posts. We use this plugin to connect with your Buffer.com account. This enables us to pre-schedule multiple social media posts to your Buffer account, while ensuring these posts don’t actually get queued up for publishing until the article that they are linked to has published from your WordPress blog. This plugin adds some SEO optimization tools. If you are using this plugin, then we will fill in the optimization fields when setting up your blog posts. If you signed up for this as part of your package, we’ll be creating an email course for you to offer to your subscribers. An email course is a series of seven emails to educate and engage your audience. Emails 1-5 are educational lessons to teach your audience something valuable. Email 6 shares your business as the next logical step to take to address all of the problems and challenges that were shared throughout the course. Finally, Email 7 answers approximately five common questions about your product or service, and acts as that final nudge for subscribers who may not have taken action after Email 6. What does the process for creating an email course look like? STEP ONE: At approximately the same time you receive your initial editorial calendar document from us (3-4 business days after your kickoff call), you’ll also receive a Google Doc outline for your email course. You’re welcome to provide feedback here using the “Comment” feature in Google Docs, so that we can nail down an outline that you’re really happy with. STEP TWO: Once we have your approval on the outline, we’ll move forward with drafting all seven emails. We typically give our writers two weeks to draft all of these emails. STEP THREE: The entire course will go through our internal editing process to make these drafts the best they can be. STEP FOUR: Once those drafts are edited, you’ll receive the drafts in a Google Doc for your review (approximately two and a half weeks after you received the outline). Again, use the “Comment” feature to offer your feedback and suggestions. STEP FIVE: We’ll address and finalize any revisions to ensure you’re happy with the email drafts. STEP SIX: When the drafts are finalized and approved, we’ll set them up in your email marketing platform and get them ready to launch. You’ll receive a link to the entire course once it’s ready for you to launch. STEP SEVEN: You’ll need to set up a call-to-action on your website encouraging your readers to sign up for the course. We can help with the wording for this. Just ask us! STEP EIGHT: Activate the email course, and watch your list continue to grow! All in all, the total production time for an email course (from outline creation to ready to launch) lasts between 4 and 5 weeks, depending on approval times and what revisions are required. Content upgrades are a piece of bonus content that complements your blog post (think a checklist, worksheet, or list of additional tools and resources). Readers need to subscribe to receive that bonus—which will be delivered directly to their inbox. 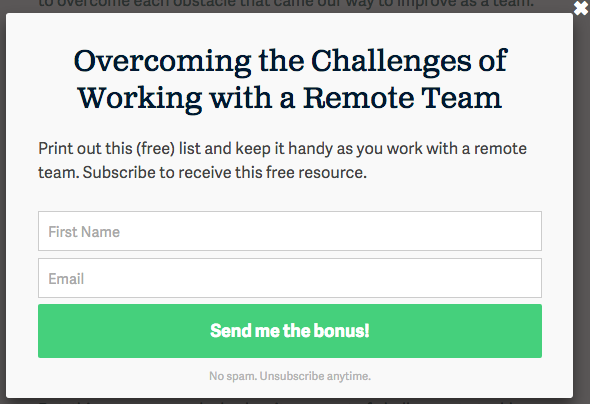 This bonus content incentivizes your readers to join your email list, as they receive a helpful and relevant freebie if they do. How do we setup Content Upgrades (in WordPress)? We use our a WordPress plugin called, appropriately, “Content Upgrades”. It is designed specifically for the purpose of delivering content upgrades to your subscribers. As an Audience Ops client, we issue you a complimentary lifetime license and we’ll install the Content Upgrades plugin in your WordPress site for you. If you’re not using WordPress, then see this guide on how we setup Content Upgrades in non-WordPress sites. How do Content Upgrades work? We create a unique Content Upgrade with a unique call-to-action / form / response for each individual blog article that we produce for you. The Content Upgrades WordPress plugin streamlines the process of setting up all the pieces that go into each Content Upgrade. What email platforms does our plugin integrate with? As of this writing, the Content Upgrades WordPress plugin integrates directly with Mailchimp, Drip, ConvertKit as well as Zapier. If you don’t use Mailchimp, Drip or ConvertKit, then you can use the Zapier.com integration to connect seamlessly with just about any other email platform, such as ActiveCampaign, Infusionsoft, HubSpot, and many others. We can handle this setup for you.